Popular pass of Everest region Cho La(5420m.) 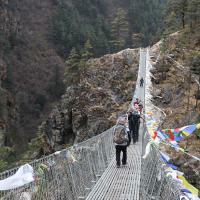 makes bridge to join Gokyo Lake and Everest Base Camp.This is the best trek of Everest Region. It’s start from Lukla and through the Namche(the Sherpa Kingdom)the trail takes you first to the Gokyo Lake where you can have two nights.These two nights of Gokyo Lake is the one of the best part of the trek. The Gokyo Lake itself is enough to give you the delighted views and panaromic views with Mt. Everest from GokyoRi(5360m)Is probabaly the lifetime achievements. After delighted two nights in Gokyo,The Cho La pass(5420m.) 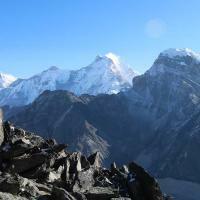 will appear to gives you another Panoramic view of Everest region with real mountain trekking trail. Again,the beautiful trail with glacier view leads you till the Everest Base Camp. And beautiful alpine valley trail through the Sherpa settlement bring you back to the ending point of the trek. HappyHari staff will be waiting for you at the airport with our company’s logo printed on the t-shirt and holding a sign with your name. Once you meet the leader you will be warmly welcomed and transferred to your accommodation in Kathmandu which will require approx. half an hour’s drive. After check-in at the hotel and refreshing you will be briefed regarding your tour programme. Early morning scenic flight to Lukla and trek to Phakding around 3hrs. About 6 hrs trek with amazing mountain scenerary leads you to the Namche. There are beautiful suspension bridges on top crystal clear river is added extra flavor on trek. Extra day at Namche has lots of options.This is the place where you get chance to buy or hire some equipment if you don’t have and this is day for acclamatization. So, we’ll take you to gain the height till the viewpoint called Syangboche where the beautifulview of Everest including others can be seen. The beautiful mountain trail with lunch stop will take you to the PhortseThanga. There are few small tea houses near the river. About 6 hrs mountain trail takes you to the Dhole village can be reach about 6hrs. Ducks on the Gokyo Lake seems surprisingly beautiful. There are few tea housesalong the lake make perfect for the overnight stay to this place. Now, time to explore surrounding the Gokyo Lake, there is viewpoint called GokyoRi( )which is one of the best viewpoint to see Everest and surroundings. There is small place called ThangNak which can be reach for lunch. This is the day to cross Cho La ( ).After this pass small mountain trail will take you down to this place. This place is located at the bottom of the Lobuche East, so it’s called Lobuche. 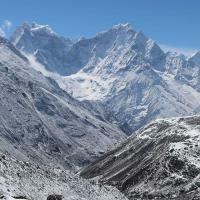 There is viewpoint to see Khumbu Glacier near from this place. This is the day for Everest Base Camp. So, better to start early morning, on the way you can stop for the lunch and after the Everest Base Camp, you’ll be back for overnight stay at Gorakship. 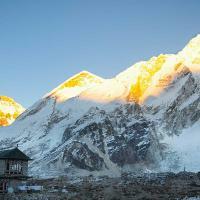 Kala Patthar,the popular viewpoint,you can climb early morning for sunrise view and start heading back to Dingboche. Now, There isfamous Tengboche monastery on the way back to Namche where you can visit and stop for tea/coffee. Transfer to Airport as per your schedule.